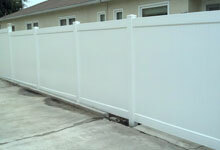 J&J Fence is committed to serving the diverse fencing needs of home and business owners throughout Carson. From simply pleasing wood picket fences to extravagant, high-end wrought iron railing, we always deliver exceptional craftsmanship at very reasonable prices. J&J Fence is a family run business that consists of talented fencing experts, each with 15 years of experience, on average. We are fully licensed, bonded and insured. We specialize in custom work using wrought iron, security iron, ornamental iron, wood, vinyl, cinder block, aluminum and steel materials to create fences, gates and railings of any shape, dimension and design. Call us today to learn more. Consultations and estimates are free! We offer Carson the full range of iron fences, all designed to meet your specific needs and style. Our ornamental iron allows us to create intricate and beautiful decorative fences, handrails, window bars and more. Our wrought iron work may not be as intricate, but what it lacks in small details, it makes up for in Old World elegance and quality. We also handcraft security iron fencing and gates, when you need iron fences and gates for security rather than simple décor. All of our ironwork can be galvanized, powder coated and/or painted any color. 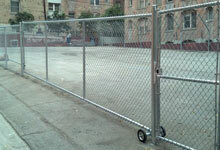 A well-built chain link fence serves a variety of purposes. It can keep in children and animals, keep out wildlife and discourage intruders from crossing your perimeter. We use the industry's best practices for creating long-lasting, sturdy and taut chain link fencing to meet the needs of any home or business owner in Carson. We can also top these fences with one or several strands of barbed wire or razor wire for added security. 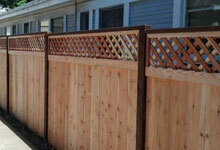 Our fence experts aim to realize your dream wood fence and gate for your home or business. Whether you want a warm and inviting picket fence or a lovely, but secure solid privacy fence, our team will build your redwood or cedar fence to your specifications using the finest craftsmanship and hardware you can find in Carson. 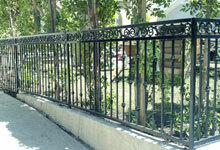 We can even add hidden or exposed iron to your wood fence to create a uniquely beautiful and extra sturdy fence. Our vinyl fences can mimic any wood fence design. Whether you prefer a stockade style or ranch rail style, your new, custom-made vinyl fence will be affordably priced and virtually maintenance free. Plus, vinyl comes with a lifetime warranty. With our wide range of materials and expertise, we can build a gate to fit any space and match any fence. We can also modify your gate with motorized operators and access control systems. Our electrician is familiar with the industry's leading manufacturers, such as LiftMaster, DoorKing, Linear and Chamberlain-just to name a few. 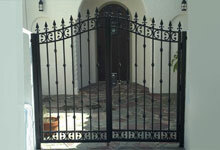 Additionally, we install folding gates and roll up doors, which are incredibly popular with our Carson business owners. Call today for a free on-site consultation and price estimate. My name is Erik Hatchett and my wife and I bought a house in West Hollywood. My friend and I started to demo the old fence and build a new one. Right after we removed the old fence my "friend" never showed up to build the new one. I was in a major pinch . . .